Earlier this month, the USI took out ads in newspapers branding Labour and Fine Gael TDs liars. THE UNION OF Students in Ireland has spoken out against Government proposals to abolish all financial support for new postgraduates from next year. The union claims that by not giving postgraduate students maintenance support and grants, they will emigrate in search of other work and study opportunities. This morning, the Sunday Business Post revealed that the Government plans to scrap state support for new postgraduate students in order to save about €50 million per year. “In practice, entry to many professions requires some form of a postgraduate qualification. Families who are not in a position to pay fees for postgraduate courses and pay for other associated costs would find it impossible for their children to progress to postgraduate courses,” continued Redmond. The value of this year’s Government maintenance grants ranges from €315 to €6,100 depending on family income and commute to college. The USI has expressed its disappointment in the Education Minister Ruairi Quinn because of his pre-election promises to ensure there would be no increases in college fees or cuts to maintenance grants. Indeed, many Labour TDs are not happy with the proposals. Speaking to TheJournal.ie this afternoon, TD for Dublin West Patrick Nulty said he would fight “tooth and nail” against proposals that were floated in the media today. “I think it is vitally important that as much pressure as possible is brought to bear on the Cabinet to make sure the Budget is fair and does not undermine young people’s opportunity to receive an education,” he said. “Abolishing grants would be a negative move – especially when other savings can be made,” added the newly-elected TD. He suggested the Department of Education can save money by looking at the subsidies paid to fee-paying schools and the university pay scales. “If we are going to grow our economy, we have to make sure that education is accessible to every single citizen,” he concluded. The USI has organised a national protest to be held on Wednesday at Parnell Square in Dublin from 1.30pm. The union expects tens of thousands of people to attend the rally to put pressure on the Government to “protect education and Ireland’s future”. Email “Students' union condemns Govt proposal to abolish postgraduate grants”. 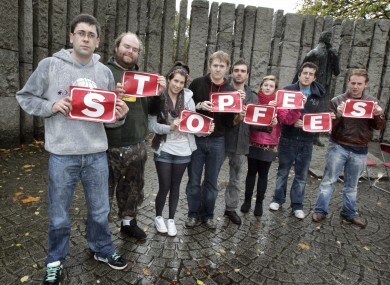 Feedback on “Students' union condemns Govt proposal to abolish postgraduate grants”.